Once you’ve considered the ‘root causes’, you are ready to examine the nature, complexity and urgency of the problem at hand. You’ll be equipped with a wide range of useful information regarding the challenge, and better positioned to navigate possible explanations. At this stage, it is important to set parameters around the ‘problem space’ so that you can avoid being distracted or overwhelmed by seemingly connected but ultimately unrelated matters, and to understand what is urgent and what is important from different perspectives. Where does the problem begin? Where does it end? For whom does it matter? Where does it seem to occur? How important is this problem to those who face it? How complex and multi-faceted is this situation? Is the problem dynamic and inter-connected with other issues and challenges? Is it urgent and/or important? You will not be able to answer all of these questions with certainty; however, posing them – at the beginning of your journey – is crucial to ensure success. To figure this out, we recommend carrying out the Humanitarian Parameters Box exercise. Possibly the most common phrase used when thinking about innovation is to ‘think outside of the box’. This is one case where you do the opposite. The idea is to build a box – to put parameters around the problem space you are going to focus on. The base of the box is the humanitarian context. Is it a rapid onset emergency? Is there conflict? Are the population on the move? Is it in a flood plain? Where the problem presents itself in the disaster management cycle is important. The beginning of the problem needs to be defined: is it during preparations for a particular season or cyclical event? Is it only when you are in the recovery phase from an emergency? You then need to identify at what point your focus on the problem ends: is it when the government can take over delivery of a service? Is it at the end of the response stage of the disaster management cycle? Then what rules, regulations, principles, or standards affect the problem space and potential solutions? For example, how are the humanitarian principles impacted by the problem? Are crypto-currencies banned? Is it illegal for refugees to work? Are there any sector standards regarding this problem? Inside the box, which parts of the humanitarian architecture are involved (or could be) in this issue? Is there a particular cluster focused on it? What organisations are working on this? Finally, who are the affected population? Is there a particular affected person who experiences this problem? What is the scope and scale of affected populations impacted by this problem? 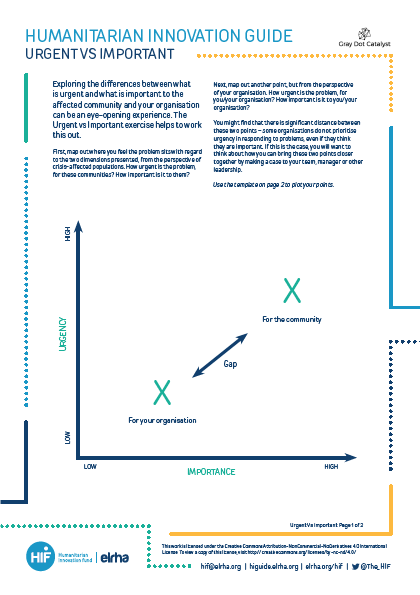 Exploring the differences between what is urgent and what is important to the affected community and your organisation can be an eye-opening experience. The Urgent vs Important exercise helps to work this out. Download the template. 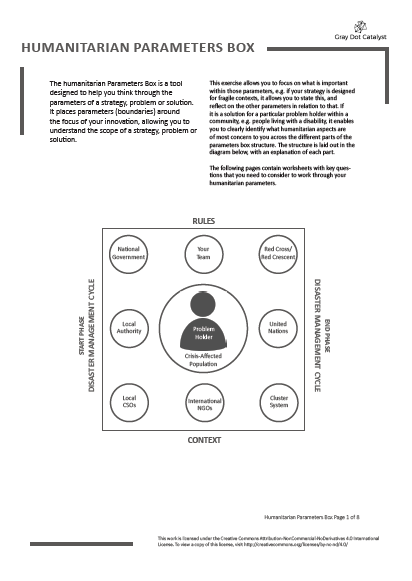 First, map out where you feel the problem sits with regard to the two dimensions presented, from the perspective of crisis-affected populations. How urgent is the problem, for these communities? How important is it to them? Next, map out another point, but from the perspective of your organisation. How urgent is the problem, for you/your organisation? How important is it to you/your organisation? You might find that there is significant distance between these two points – some organisations do not prioritise urgency in responding to problems, even if they think they are important. If this is the case, you will want to think about how you can bring these two points closer together by making a case to your team, manager or other leadership. This is the last sense-check you need to make before deciding whether it is worth moving on to the next section: the Challenge Brief. If you find that the gap cannot be bridged. Then you will probably need to ‘shelve’ this as a problem that your organisation should not work on. In this case, do not lose your good work. See if there are other organisations for whom there is a greater alignment of the problem and their strategy and work. If there is sufficient alignment, you are now ready to move onto the next step. Exploring the size of the problem at the local and global level can help you identify how much energy and effort may be required, and how far the impact of a solution could go. Download the template. The vertical axis of the graph represents the number of people affected by this problem: the breadth of impact. 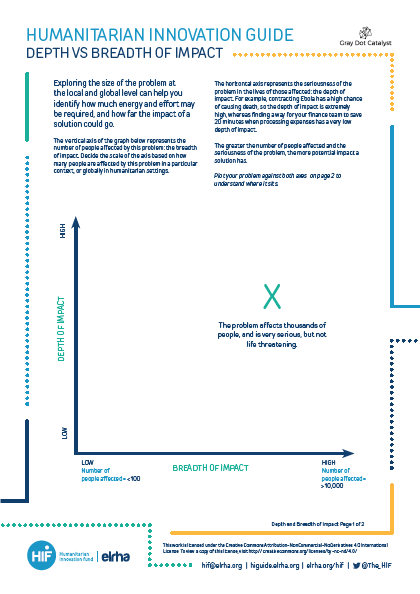 Decide the scale of the axis based on how many people are affected by this problem in a particular context, or globally in humanitarian settings. The horizontal axis represents the seriousness of the problem in the lives of those affected: the depth of impact. For example, contracting Ebola has a high chance of causing death, so the depth of impact is extremely high, whereas finding a way for your finance team to save 20 minutes when processing expenses has a very low depth of impact. The greater the number of people affected and the seriousness of the problem, the more potential impact a solution has. Imagine that you have to persuade your manager to give you the time and space to work on the issue you’ve uncovered, or that you have to persuade a donor to fund your project. What would you say? One way to think about this is to make the case for ‘What’s at Stake’. This activity will help you make the case as to why your problem is important to solve, including an articulation of the value-add (What are the potential benefits of responding?) and accounting for the consequences of inaction (What are the implications if we don’t act?). You will need to articulate this from both the problem holder’s perspective, and from your organisation’s perspective. From the perspective of your organisation: what is the most important reason for responding to this challenge? What would be most concerning to your organisation if you did nothing? Write down one answer for each question. From the perspective of the user: what’s the most important reason for responding to this challenge? What would be the consequences for both of them if we did nothing? Write down one answer for each question. Next, you’ll want to share your answers with the rest of the group, going around the table. At this point, someone should be collecting the questions and placing them up on a wall where everyone can see. Then take a dot sticker (two per person) and vote for the most convincing answer from the point of view of your organisation and from the point of view of the affected population. We would recommend mapping the final categories on the ThoughtWorks Criteria for Problems Framework to visualise the different categories and their importance. When doing this exercise, we tend to find that sometimes the initial responses aren’t always the ones that are voted on in the end. While all of the suggestions are important to consider, you will have to really hone in on the most convincing for your Challenge Brief!